“Live and Die,” “November Blue,” and “Head Full of Doubt,” and other favorites filled their line up. I was high on happiness! Suddenly that all changed. The lights dimmed. The brothers huddled together, and they began a duet I hadn’t heard before. Their mournful voices delivered six simple lines, and my eyes welled. Quick check to my left and right. Phew! No one was watching. My lips quivered and a few tears spilled over. What the hell? Pull it together, Kim. Tipping point – an involuntary sob burst out. Awkward! Despite feeling mortified, that moment exemplifies why I love music. It evokes emotions. I tend to shy away from the like of “Through My Prayers,” at least in public, but my playlists contain a virtual arsenal of songs to match (or change) my mood. Searching for a little smile? I may go a little old school with The Sugarhill Gang’s “Rapper’s Delight” or “Jessie’s Girl” a la Rick Springfield. But when I’m really struggling to shake off the blues, only one ditty will do. “They call me Dr. Worm. Good morning. How are you? I’m Dr. Worm. From the peppy “bat, bat, bat, dat, bat” of the brass to the ludicrous lyrics, listening to “Doctor Worm” has effectively wiped away hundreds of moments of frustration or despair. That’s the power of music and why this song, hands down, wins my title of “ultimate feel good song.” They Might Be Giants, but I think they also might be brilliant! How about you? What’s your ultimate feel good song? Happy 3 year birthday, Yeah Write! 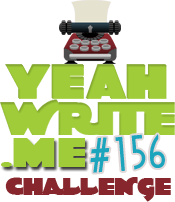 If you haven’t checked out this writing challenge or the great bloggers who submit there yet, you should! It’s a wonderful writing community for fiction and non-fiction writers. I know that feeling all too well, that song that makes my insides all (fill in the blank). So, on my way to work, I’ve been fascinated by The Neighbourhood “Sweater Weather”. I think it has to be the line’s: “In California with my toes in the sand” and “you in those little high-waisted shorts”. With all this cold weather in NY it’s just a glimmer of hope for the warmth that soon approaches. It puts an extra skip in my step. First, I’m so glad that I’m not alone with the emotions of that AB song. Second, the rest of your comment, to me, exemplifies how differently folks can focus on different lyrics based on their own experience. I love that! Thanks for sharing! aww yay The Avett Brothers makes me happy! I’m a huge believer in music and it’s feel good healing powers. Or even feel sad music powers because sometimes we just NEED to cry and music seems to be the only way that we can let ourselves. I have a million ultimate feel good songs depending on the day or era i’m into. Lately if I hear Daft Punk’s “Get Lucky” I will dance my tailski off! I know. Aren’t the Avett Bros the best? I love them. They occasionally make me cry, but more often than not, they make me smile and dance. And I have to agree that “Get Lucky” is a great shake-your-booty song (by car, desk or dance floor). I’ve just discovered them (the bros) a few months ago (Crazy, right?) and have loved just about everything I’ve head. An excellent choice of a feel-good and empowering song! Good choice! Haha! Love it! That song brings out an insatiable desire to do a weird thumbs-up dance shuffle for me…something that should never be witnessed. I love Dr. Worm!! My other go-to song is Manic Monday, danced to with all the flair of my childhood bubblegum pop days. why haven’t I heard of the Avett Brothers? 😦 that song is just gorgeous.